Those three famous mittens, dramatically punctuating a hauntingly beautiful, russet landscape. Could there be anything more iconic of the American Southwest? Driving the long, straight road that leads to the famous outlook, I can't see the mittens. They sit on the valley floor, concealed by a ridge. That the beauty of the mittens is not betrayed on approach makes their final reveal one of grandeur. Parking the vehicle, I take a seat on the lip of the ridge and drink in the postcard-perfect panorama. Many surreal landscapes neighbour Monument Valley – Zion National Park, Grand Canyon National Park, Horseshoe Bend, to name a few – but none emote spirituality in quite the same way. It’s lovely, but I can't ignore the tour buses that pull into the lot behind me – and the assembly line of tourists they churn out. People spill out from the coaches, flock to the lip of the ridge and take selfies. Through their viewfinders, they capture a photo that has already been snapped a million times before. Then, for good measure, they take one hundred more. In the time it would take me to finish a coffee, they’ve already been shepherded back onto the bus. 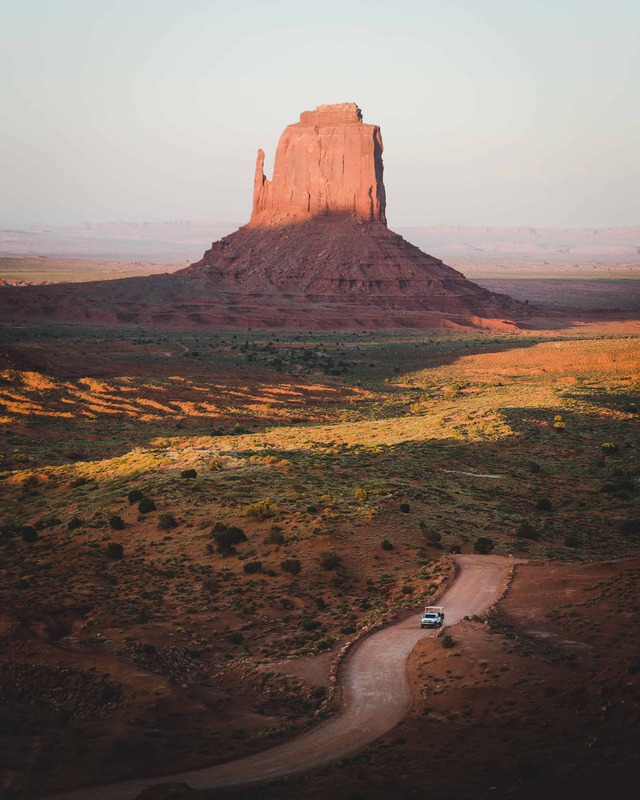 These travellers won’t make it to the floor of Monument Valley; the wonders of the scenic 17-mile Valley Drive loop will evade their consciousness. I find it all very incredulous; something akin to arriving at the gates of Machu Picchu, only to toe the nearest ruins and turn back. 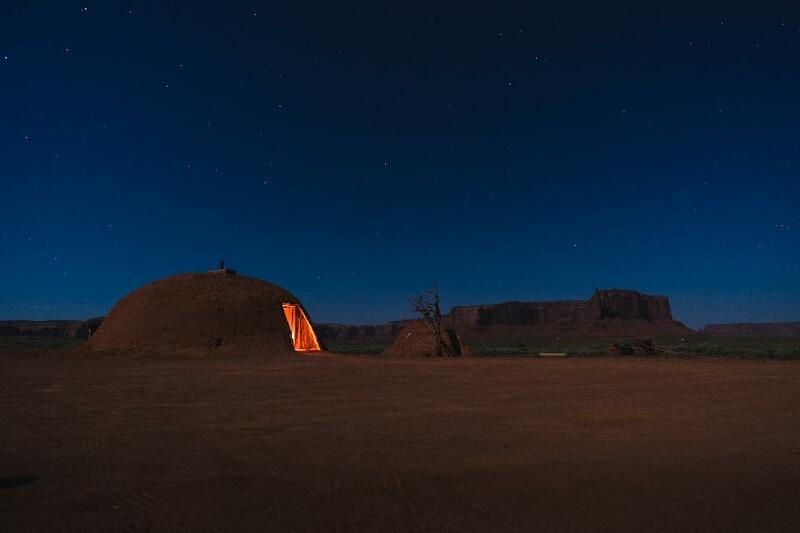 Lucky for me and my travel companions, we are spending the night in Monument Valley. As in, on the floor of the Valley, among those sentinel mittens. 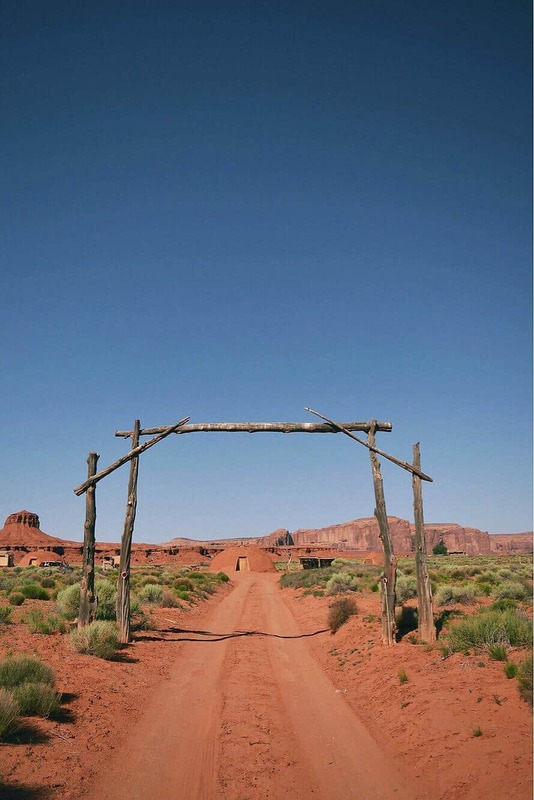 Our lodgings are a traditional Navajo hogan, and our hostess is a soft-spoken woman named Verna. Accommodations along the Valley Drive are few and far between (and largely limited to camping). In fact, the entire Navajo Tribal Park is extremely under-commercialized. Our hogan isn’t listed on a hotel search engine. This experience is delivered only by the grassroots entrepreneurs of Airbnb. We pull up to our hogan just after sundown. We won’t meet Verna until tomorrow, so we have little context with which to understand the hogan. For now, we simply absorb the rustic digs and the supernatural setting that envelopes it. The hogan’s interior is cozy. Creature comforts, like electricity and running water, are noticeably absent. 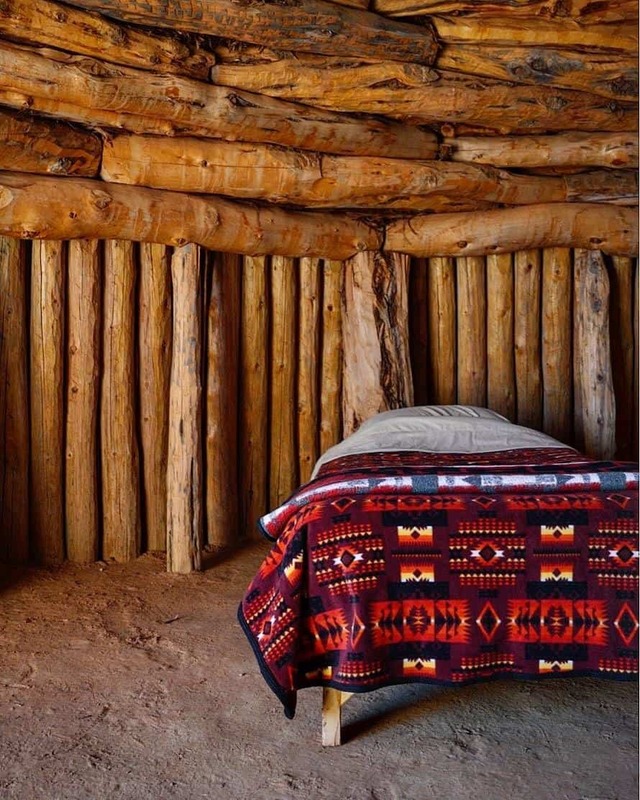 Four twin beds are dressed in Southwest-style, fleece blankets. Woven art adorns the walls. A stove stands in the centre of the hogan, its chimney stretching through a hole in the domed ceiling. There’s a rudimentary kitchen and the bathroom is an outhouse. It’s not quite camping, not quite glamping. Our first task is to light a kerosene lamp. It's an action that inspires nostalgia while testing our Millennial aptitude. 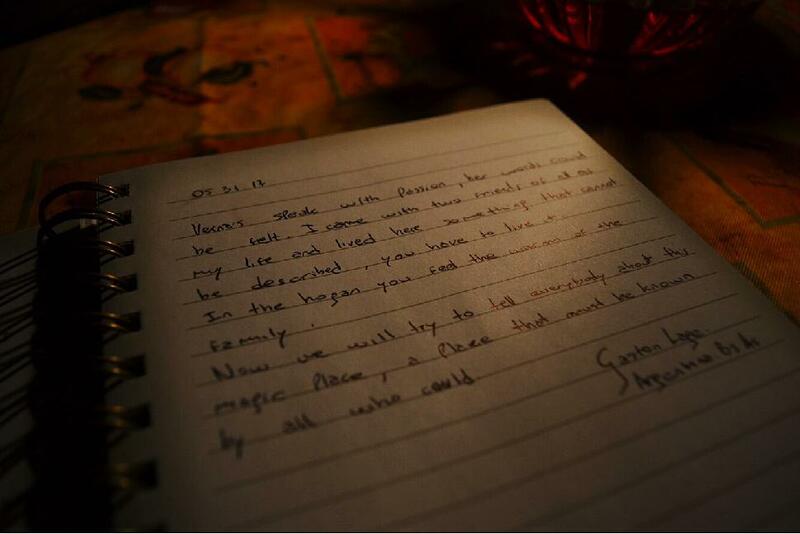 The flame illuminates a guest book. The pages are filled with the words of guests who describe their overnight stay with spiritually charged candor. It's a far cry from your typical TripAdvisor review. Beneath the full moon, we assemble some chairs and watch the stars slowly pierce the night sky. An errant horse nudges its way through the arid scrubland. The wide-open spaces echo with silence. The next morning we rise with the sun. We drive the bumpy road back up to The View Hotel outlook. The road rocks and rolls our acutely under-caffeinated brains. When we arrive back at the hogan, we find Verna tending to the property. We invite her inside and ask her to tell us about the hogan, and how she came to find herself hosting guests on Airbnb. She happily indulges us. The hogan we occupied for the night was never inhabited. Verna’s mother and grandmother made their livings demonstrating weaving techniques to tourists, which took place in the hogans. "When the shape of the hogan is round, it’s called a female hogan. The round shape represents the womb of Mother Earth. As her children, this is where she protects us from outside forces. This is where we get our rest: spiritually, emotionally and physically. This particular hogan is a female hogan," Verna explains. "The female hogan is primarily used to raise your family and a lot of ceremonies happen here. Traditionally, when the man marries into the family he builds the hogan for his wife. The man keeps his belongings on the southern side. The woman’s belongings stay on the northern side, so there’s balance between the man and woman in any home. The chimney represents the bellybutton and the hallway is the way out of our Mother’s womb." How is a Navajo hogan built? "The first thing that is set in place is the doorway. The doorway will always face east. Any house, hogan, or trailer will always face the east. As Navajos, we believe we get a lot of our good blessings from the east. So, before the sun rises, we wake up and rise with the sun. We go jogging or running to the east and then come back inside. Once we get inside, we move in a clockwise direction, going all the way left around the fireplace. Once the location has been determined, the posts are set in place. This is a larger hogan. There are 12 posts to represent the 12 calendar months. The smaller hogan has nine posts, and is more of the traditional size. The nine posts represent the nine-month pregnancy of a woman. Once the posts are in place, you go ahead and set the beams, always working in a clockwise direction. The hogan is built with cedar. A lot of our cedar is found in Cedar Mesa. I’m going to guess, if you count all the logs, there are about 500 pieces that make up the construction of this particular hogan. Normally, a smaller piece will take 365 pieces, one for each day of the year. Once the cedar is transported, the trees are stripped of their bark, which is set aside. The beams are dried out and rid of any ants. The [beams] are all inter-locking. The only nails you see are those we use to hang pictures and art. Each log is chipped so it will rest upon the previous log. It’s pretty much like putting a puzzle together. Next, you go back and plug the holes and crevices with bark, because you still have to put sand on top of it. When everything is secured, dirt [is packed] on the outer service. We don’t cover our floor because this is our connection to Mother Earth. In summer, we will water down the floor to keep the dust down and cool the inside. It usually takes four to five months to build a hogan, depending on how many people are available – usually four to five. Once it has been completed, the medicine man will come in and bless the home using corn pollen." When I ask her, Verna reports mostly positive guest experiences, but she stresses that the hogan is not for everyone. "We’re not anything like a hotel," Verna says with a laugh. "I once had some guests who didn’t realize it was primitive, [that] there’s no running water or electricity. They left." I find this surprising. Verna makes no illusions about the rustic nature of hogan living. Hotel amenities are the exact opposite of what makes the hogan special. Our stay was indelibly authentic, comfortable but not catered. In fact, it might just be the most memorable night you don't spend in a hotel. 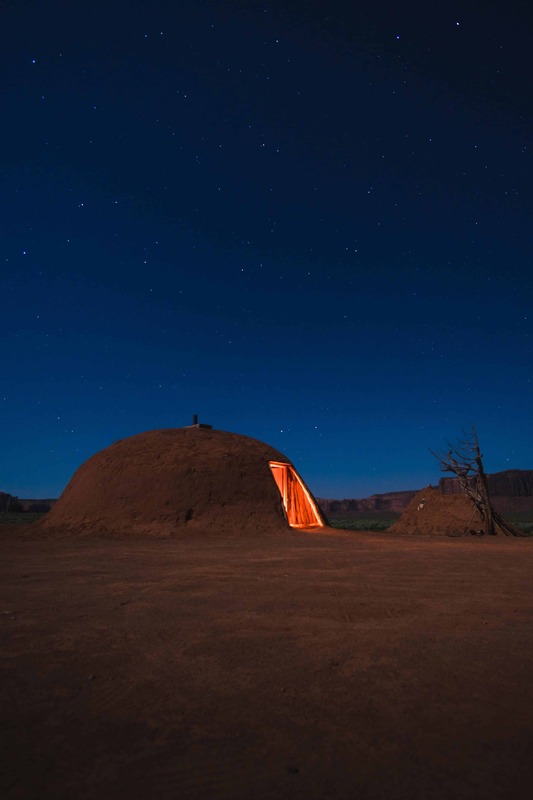 Provisions can be quite limited in Kayenta, and even more so within Monument Valley Navajo Tribal Park. Depending on your direction of travel, bring groceries from Page, AZ or Moab, UT. 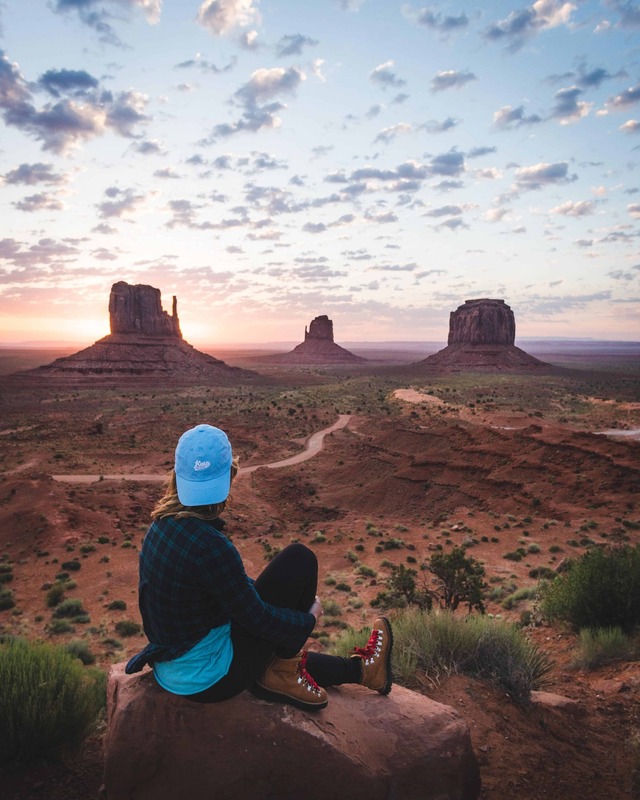 Activities in Monument Valley include hiking, horseback riding, a museum and gift shop at The View Hotel, cruising the 17-mile (unpaved) Scenic Loop, and driving to nearby Goose Necks State Park. Are you inspired to stay in a hogan? Got a question about my experience? *Disclosure: accommodations were subsidized by Airbnb; all opinions are my own. With no earthquakes, tornadoes or floods, the delicate structures that have been carved over the centuries remain intact for visitors to admire.